When you walk into the Blanton Museum of Art’s newest temporary exhibit, the first thing you see is bits of scrap metal and wire that are twisted and melded together to form a set of uniquely designed eyewear sculptures. The glasses from the collection C-Stunners, look like something a quirky inventor would wear. 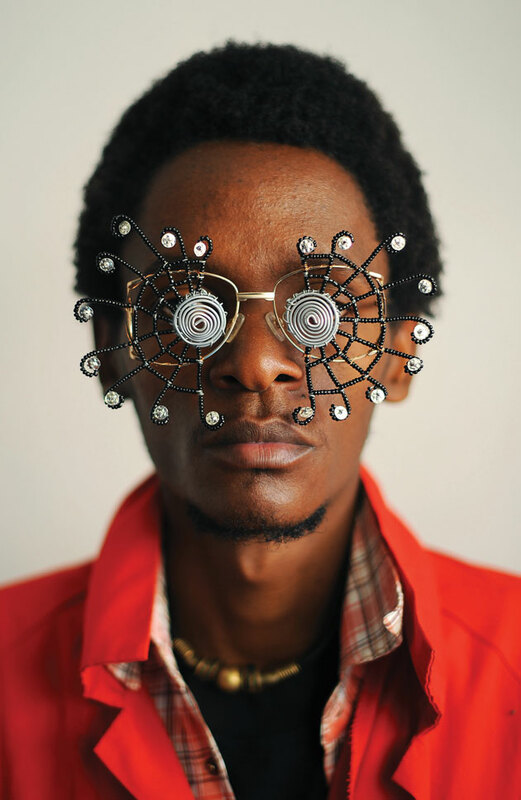 But look further and the symbolism becomes clear: the obscured spectacles represent the historically restricted view of Africa that onlookers are encouraged to leave at the door, opting instead for a new perspective and an open mind while browsing the exhibition. Making Africa: A Continent of Contemporary Design showcases the work of more than 120 artists and designers from 22 African countries, providing just a peek into the cultural and creative makeup of the massive continent. On display is artwork ranging from retrospective prints and intricate fashion to sleek futuristic furniture and even interactive websites. The exhibition is divided into four parts, beginning with “Prologue,” which urges viewers to question their view of Africa and African design and let the art presented help them develop a new perspective. The following sections take the audience through pieces that express ideas such as communication, gender representation, urbanization, and finally, in “Origin and Future,” how Africa’s pre-colonial and colonial past fit together to inspire works of the future. The exhibit presents a new interpretation to the design and art viewers might be familiar with. The result is an enthralling novelty for art lovers and casual appreciators alike. The Blanton has displayed a handful of design exhibits in the past, but Howard says what sets Making Africa apart is its contemporary material, as it highlights young artists who produced a bulk of the work within the last 10 years and accentuates their digital-nativeness—meaning they were raised in the age of digital technology—through pieces like the various websites, apps, and online games sprinkled throughout the show. “It has a really strong emphasis on the internet and on how mobile technologies have facilitated communication within the continent, but also prompted designers to think about addressing an audience beyond the continent,” Howard says. The exhibition was conceived with a global audience in mind by the Bilbao Guggenheim and Vitra Design Museum in Germany, where the show began its tour three years ago. Since then, a number of artists featured in the show have gained some celebrity. Pieces by Senegalese fashion designer Selly Rabe Kane, whose futuristic Alien Cartoon collection is featured in Making Africa, have been sported by Beyoncé and a scarf worn by T’Challa in the blockbuster hit Black Panther is from the label Ikiré Jones, which has three similar pieces in the exhibition—one of which, Howard says, is her favorite in the show. That piece, titled “The Madonna,” belongs to the 2014 Ikiré Jones collection called The Untold Renaissance. 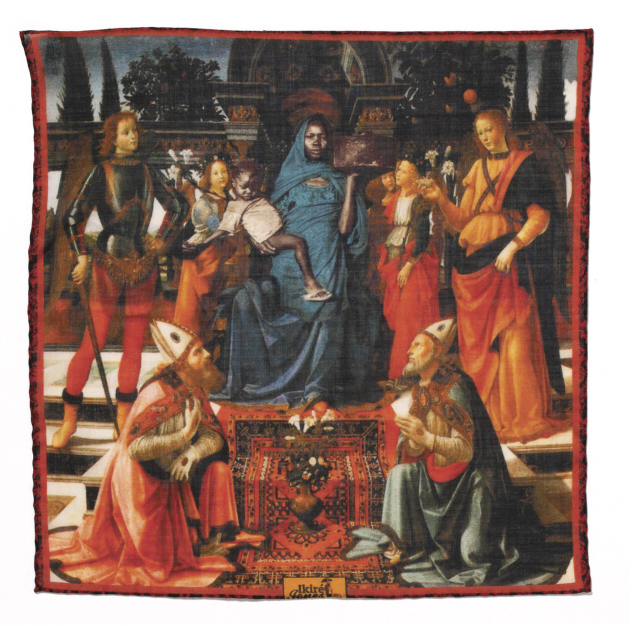 In the series, the designer behind the label, Walé Oyéjidé, repaints familiar renaissance images with black people as the protagonists, proposing a historically ignored perspective in art. This piece in particular shows an African woman adorned in blue perched on a throne with her young child, who is dressed in an old T-shirt and flip-flops. The juxtaposition of eras contained in the artwork only adds to the intrigue. “He’s doing it in a series of pocket squares that are made of silk, and so they’re these beautiful, functional objects, but they’ve been inscribed with imagery that has this subversive quality of kind of rewriting art history,” Howard says. The fresh viewpoints and interpretations embodied in the show provide a special opportunity for budding art historians as well. Because the exhibition opened at the Blanton a little more than a month after the start of the fall semester, art history professor Moyo Okediji jumped on the chance to model a 35-student course called “Making African Art” around it. He says the exhibit provides an invaluable way to see works from a different country up-close, rather than having to rely on images alone. Making Africa will be on display in the Blanton’s Butler Gallery through Jan. 6. 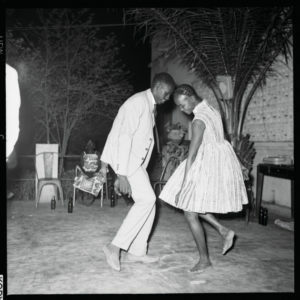 Photographs from top: Cyrus Kabiru, “Caribbean Sun,” 2012, from the series C-Stunners, Carl de Souza/AFP/Getty Images; Malick Sidibé, tunNuit de Noël (Happy Club), 1963, courtesy CAAC and Magnin-A, Paris © Malick Sidibé; Ikiré Jones, “The Madonna,” 2014, from the collection The Untold Renaissance, Walé Oyéjidé.